The Academy Awards are like Super Bowl Sunday for film buffs. And like professional football's annual championship extravaganza, the spectacle is overlong, self-congratulatory and programmed to the point of phoniness. I steer clear of the Golden Globes and don't bother watching with the Screen Actors Guild awards. But for film lovers and critics alike, the Oscars—for all its faults—remain the preeminent celebration of not just films but cinema itself. The day the Oscars disappear for lack of interest, you have to worry whether the medium is far behind. Moreover, the Oscars drive the national conversation toward movies, good movies, if only for this week. And because of that, an entire film production and marketing apparatus is built around the movie awards season, with the Academy Awards as the ultimate brass ring. How many of this or any year's nominated films and performances would exist absent this admittedly unseemly quest for industry plaudits? Moreover, how many moviegoers would bother seeking out and watching Birdman, The Imitation Game, Whiplash or Still Alice (or their annual equivalent) without "Oscar buzz" driving the collective conversation? More sobering, how many of these films wouldn't even get produced? That's why I'll be watching when the golden statuettes are handed out this Sunday at the 87th Annual Academy Awards. So, here's my annual primer of what/who will win and should win each of the six main categories, plus what actor or film was robbed of their rightful nomination. What Will Win: This was Boyhood’s Oscar to lose until late last month. Then Birdman won the Producer’s Guild of America award for best theatrical motion picture—once an irregular harbinger, the PGA winner has won the last seven Best Picture Oscars. Add in an Ensemble Cast award from the Screen Actors Guild (SAG) and Academy voters’ affinity for self-referential films about the entertainment industry, and Birdman now appears bound for a gilded cage. What Got Snubbed: … Foxcatcher. Despite the fact that director Bennett Miller is among the five Best Director nominees, somehow the Academy didn’t deign Foxcatcher worthy of its two unused Best Picture slots. Who Will Win: Once again, I would have bet good money on Richard Linklater winning this in a walk. But you can’t refute the odds, in this case the fact that the 66 winners of the Directors Guild of America award have won the corresponding Academy Award for Best Director all but seven times—the last time a DGA winner also nominated Best Director Oscar didn’t win was Rob Marshall in 2002. This year, Alejandro González Iñárritu won the DGA for the suddenly high-flying Birdman, and I expect he’ll win the Oscar this Sunday. Who Should Win: I have much admiration for Linklater’s epic work in making Boyhood. But Wes Anderson shows glorious aplomb in every element of filmmaking in crafting The Grand Budapest Hotel. Who Got Snubbed: Besides Whiplash being the best film of 2014, director Damien Chazelle (who is nominated for Best Adapted Screenplay) was BAFTA-nominated for his exhilarating direction. He deserves to be among the five Oscar nominees over Tyldum and Miller. Who Will Win: Late surges are the theme this year—Michael Keaton was the consensus pick throughout most of the movie awards season, bolstered by a Golden Globe award. But the SAG’s selection of Eddie Redmayne reminds us that he ticks off the most Oscar acting predictors: 1) British, 2) playing a famous real person, and 3) playing a person with a disability. Cumberbatch comes close but falls short of Redmayne in categories two and three. Keaton can’t compete, even as the oldest nominee. 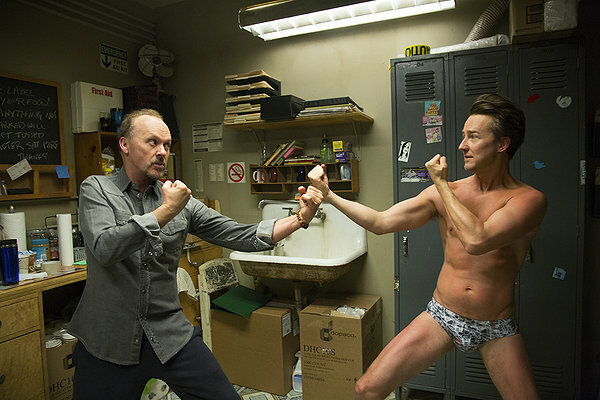 Who Should Win: In a year replete with terrific male acting performances, Michael Keaton provided the most amazing yeoman’s work in Birdman and deserves the Oscar. Who Got Snubbed: Who wasn’t? Ralph Fiennes in The Grand Budapest Hotel, Jake Gyllenhaal in Nightcrawler, David Oyelowo in Selma, and Oscar Isaac in A Most Violent Year were all deserving. But Tom Hardy in Locke is a stunning, one-man acting class. Who Will Win: Julianne Moore has also swept the pre-Oscar awards and ticks off one big Oscar predictor is playing an early-onset Alzheimer’s disease sufferer in Still Alice. But her heartrending performance also has the added benefit of being brilliant. Who Should Win: Reese Witherspoon was terrific in Wild, as was Marion Cotillard’s understated turn in Two Days, One Night. But Moore deserves this award by a wide margin. Who Got Snubbed: Jennifer Aniston received much critical acclaim for her lead in Cake. But Essie Davis is my personal pick for not only a nomination but the winner for her stark portrait of maternal malaise and madness in the psychological thriller The Babadook. Who Will Win: J.K. Simmons has swept virtually every pre-Oscar award in this category and is the biggest shoo-in winner this year. And deservedly so. Who Should Win: Simmons was more than a sadistic music instructor in Whiplash. He was young Andrew’s personified id and our unsettling soothsayer about the high price of genius. Who Got Snubbed: Anybody not nominated instead of Robert Duvall. To narrow it down to one, John Goodman’s caustic, cold-blooded gangster steals in the show in an otherwise forgettable The Gambler. Who Will Win: Again, Patricia Arquette has swept all the pre-Oscar accolades, and it’s increasingly looking like this will be the lone major award for Boyhood. Who Should Win: Of the nominees, I’d give Arquette the slight nod over Laura Dern and Emma Stone. Who Got Snubbed: Anybody not nominated instead of Meryl Streep. I adhore Jessica Chastain’s gritty, tough-as-nails performance in A Most Violent Year. But my pick is also who should have won this category: Tilda Swinton and her zany yet unsettling turn in Snowpiercer.